Madison, WI is a vibrant liberal college town with strong cultural, political and aesthetic views. Find eclectic shops on a walk down State Street, some of the best pizza made with infamous Wisconsin cheese and one of the nation’s best farmer’s markets around the capitol. There is something for everyone to enjoy. While visiting Madison, the place to stay is the Hilton Madison Monona Terrace hotel. overlooking Lake Monona and within minutes of the University of Wisconsin Madison campus. The friendly staff, cozy ambiance and convenience make this a perfect choice. The award-winning Capitol Chophouse offers its 28-day aged beef and line-caught seafood, three private dining rooms along with outdoor dining. The Olive lounge offers guests Relax with breakfast and a Starbucks coffee in Olive lounge. The Executive Suites on the 14th floor overlook Lake Monona and offer access to the Capitol Club Executive Lounge. Take the skywalk to the Frank Lloyd Wright-inspired Monona Terrace Community and Convention Center and then to Wisconsin attractions such as the Henry Vilas Zoo, Overture Theater District and State Street are just a few blocks away. The Hilton Madison hotel offers complimentary airport transportation to and from Dane County Airport daily from 7:00am – 10:00pm. 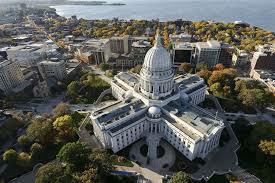 Located on the downtown isthmus bordered by lakes Monona and Mendota, the Wisconsin State Capitol building, completed in 1917, features the only granite dome in the United States.The Interior of the 284 foot-high Capitol contains 43 varieties of stone from around the world, decorative murals, glass mosaics, and hand-carved furniture.Year-round tours are offered Monday through Saturday at 9:00, 10:00, 11:00 a.m. and 1:00, 2:00, 3:00 p.m.; and Sundays at 1:00, 2:00, 3:00 p.m. A 4:00 p.m. tour is offered weekdays (excluding holidays), Memorial Day through Labor Day. Admission is free. Call ahead for group reservations 608.266.0382. Each Saturday morning 18,000 people visit the Capitol Square to partake in one of the finest farmers’ markets in the country. It’s a Madison tradition to take a stroll around the Square and survey the fresh produce, herbs, plants, flowers, cheeses, bakery items and other delicacies from 300 local vendors. The market runs on Saturdays from late April Saturday through the first Saturday in November from 6:00 a.m. –2:00 p.m.Wednesday’s Farmers’ Market runs from 8:30 a.m.–2:00 p.m. from the first Wednesday in May through the last Wednesday in October in the 200 block of Martin Luther King Jr. Blvd. brings to life a design originally inspired by Frank Lloyd Wright in 1938. This 250,000-square- foot building combines spectacular vistas with flexible meeting and exhibition space. The expansive rooftop garden is the perfect spot for a picnic or concert. Monona Terrace offers year-round community programs such as the free “Tunes at Monona Terrace” series and “Dane Dances.” The gift shop offers an artful selection of merchandise. Daily tours at 1:00 p.m.; tour fee is $3 per person. Groups of 10 or more should call 608.261.4015 two weeks in advance. One John Nolen Dr., Madison,WI 53703. 608.261.4000. Overture Center for the Arts has transformed the 200 block of State Street into an impressive 400,000 square foot, world-class visual and performing arts facility. The completion of Phase I construction in September 2004 unveiled the magnificent Overture Hall, with its dazzling lobby, four new performance and rehearsal spaces and additional reception spaces. Phase II, completed in April 2006, yielded a larger Madison Museum of Contemporary Art and the newly renovated Capitol and Playhouse Theaters. Located at 201 State St., Madison. 608.258.4177. This wonderful hands-on museum for children ages birth to eight features four permanent interactive exhibits designed to provide children with opportunities to explore, think, face challenges and develop new understandings of the world around them.Also offers weekly programs and special events. Hours: Sunday, Noon- 5:00 p.m.; Monday, 1:00-6:00 p.m.;Tuesday-Friday, 9:00 a.m.-4:00 p.m.; Saturday, 9:00 a.m.-5:00 p.m. Ages one & up $4. 100 State St., Madison. 608.256.6445. One of the nation’s few free zoos, the Henry Vilas Zoo is open year-round. See a wide variety of wild animals, birds, reptiles and fish, including a children’s zoo during the summer months three new state of the art terrariums that contain native South American plants and have individual life support systems that create a natural and enriched environment for some very beautiful and highly endangered frogs. Grounds hours: 9:30 a.m.-5:00 p.m. daily. Building hours: 10:00 a.m.-4:00 p.m. 702 S. Randall Ave., Madison. 608.266.4732. The Wisconsin Historical Museum is located on Madison’s Capitol Square and is full of wonderful information about the State’s rich history. Explore Wisconsin’s distinctive heritage and a variety of other American history topics through artifacts, photographs, full-scale dioramas, audio-visual presentations, and interactive multimedia programs. Open Tuesday through Saturday 9:00 a.m.–4:00 p.m. Closed every Sunday and Monday. 30 N. Carroll St., Madison. 608.264.6555.
periodically. Conveniently located on the Capitol Square. Sundays, April through September only, Noon–4:00 p.m.
Olbrich Botanical Gardens offers a spectacular tropical conservatory, 16 acres of outdoor display gardens, and a botanical center. Outdoor gardens are open 8:00 a.m.- 8:00 p.m. (April through September) and 9:00 a.m.- 4:00 p.m. (October through March). Admission is free. Conservatory hours are 10:00 a.m.–4:00 p.m. Monday- Saturday, and 10:00 a.m.–5:00 p.m. Sunday. Admission to the Conservatory is $1 for adults; children 5 and under are admitted for free. 3330 Atwood Ave., Madison.